ICE BLADE PRO V2.0 comes with 4 Core Touch Technology (CTT) heatpipes directly contacting the CPU. Zero-noise and excellent heat dissipation performance makes ICE BLADE PRO V2.0 the ideal choice for a wide range of purposes. 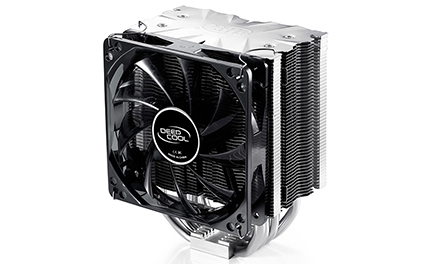 ICE BLADE PRO V2.0 can be provided with a second fan and is a must-have thermal solution for gaming environments. Four Ф8 mm heatpipes rapidly conducts heat away from the processor and avoids overheating. Large aluminum fins providing a huge heat dissipation surface for effective cooling. 120 x 120 x 25mm PWM-capable fan generates optimal airflow. The intelligent side flow design feature leverages existing system airflow to further enhance computer case ventilation. Four Ф8 mm heatpipes rapidly conducts heat away from the processor and avoids overheating. Patented Core Touch Technology (CTT) achieves a perfect contact with the CPU surface. Large aluminum fins providing a huge heat dissipation surface for effective cooling. Designed specifically for Intel core i7, and is the perfect choice for overclockers. Enter a product name below to check compability with the:"ICE BLADE PRO V2.0 "